I love my PS3, not in a romantic nature but more so of what a powerful gaming console it is. From the games to Blu-ray and online play, this is the definitive high-end console. However, my biggest gripe with the PS3 is that it is not very eco-friendly and in order to charge my PS3 controller, the console needs to be on and if I want to play the console while charging, I need to sit almost a metre away from my plasma TV because of the ridiculously short power cable. Of course, longer cables are available but that's not really the point, not is it very green friendly or gamer friendly in my books. 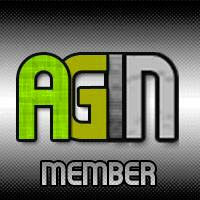 So what's a gamer to do? Coming to the rescue is Energizer, one of the world’s most renowned battery companies with the Power and Play Charging System for the PS3 to become the new hero for gamers around the globe. 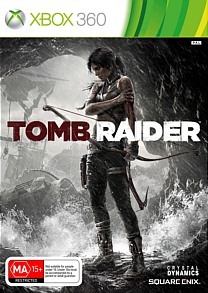 It should also be noted that this device is available for the XBox 360 and the Nintendo Wii. So what exactly is the Power and Play Charging System? To cut a long story short, it's basically a standalone charging device that does not require my PS3 to be turned on to charge. 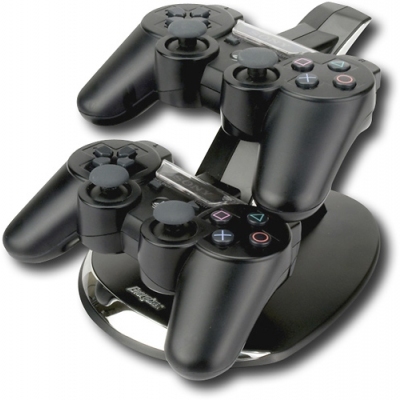 And as another bonus, the Power and Play Charging System allows you to charge two PS3 controllers simultaneously. In terms of charging, the unit charged both my DualShock PS3 controllers is just over 2-hours which is very impressive and considering the good power consumption of these controllers, it’s a very small price to pay to be without a controller. Just charge it in your gaming downtime. 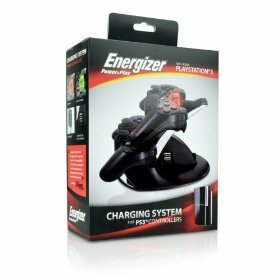 Although not the sexiest looking piece of technology, The Energizer Power & Play Charging system boasts a jet black stand which has two PS3 USB connections on it and is relatively quite light. In order to charge your controllers, all you need to do is plug the Power & Play Charging System into your power socket, gently push the controller onto one of the USB connections and presto, your device begins to charge. There is a red LED on the unit as well which indicates that your device is charging and once charged, this light changes to green. It's that simple! In conclusion, it’s great that Energizer has catered for the gaming market and if you’re a 360 or Wii gamer, a compatible Power & Play Charging System is also a must have for you. Considering that certain PS3 units are quite power hungry, this is the perfect charging device for all gamers and even though it may not look like much, this is probably the one accessory that all gamers should have access too.